Here’s my story: Not too long ago we moved into a house whose back yard faces a well-traveled road but we have a rather high, brick wall surrounding the patio yard which buffers a lot of sound. I was commenting on how peaceful it is to just sit in the yard with your eyes closed. The road noise from the occasional car passing by reminded me, with a powerful imagination, of ocean waves slowly rising to shore, crashing and retreating. Every now and then a powerful wave crashes. That’s the equivalent of a noisy car or truck. (I used to live seaside). So, sitting in the yard is a pleasure until recently there has been such a noise that has become maddening. It sounds like a machine, or some sonar-type impulses. I hadn’t noticed it before. The noise disappeared that evening so I was convinced it was a machine. But no! The next day it was back. I later ventured into Water Valley to preview a house for a client. When I opened the car door I was struck, full blast, by the same sound. Was there some kind of inviso-shielded space craft hovering over my space to antagonize my ear drums? My husband heard it. The window-treatment rep who came to my house the day before heard it. My neighbor heard it. We were all stumped. I headed to the office which sits across Highway 6 from the Ole Miss campus and the Park and Ride lots. Getting out of my car I heard it again. I texted my husband with the news and received a reply: “someone said it was cicadas,” he explained. That was a much better explanation than an invisible hovering space craft. This morning after writing this story, I read, in the Sunday edition of the Oxford Citizen newspaper, that cicadas have invaded. Sigh of relief. 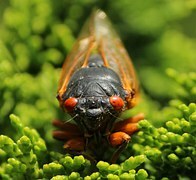 Cicadas are friendly, although annoying. They present no threats to beam any of us up to some unknown adventure and will die off soon. According to the article, sometime around mid-June our environment will quiet down again. And if not, watch the skies.